Crow Canyon Software is a leading subject matter expert in SharePoint and Office 365. 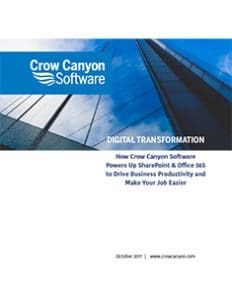 Access Crow Canyon’s whitepapers to unlock all the information we have to share on the core business applications we service as well as our outlook on technology changes down the road. Our whitepapers are free to download and share and if they leave you with unanswered questions, we’re here to answer them. Crow Canyon’s unique NITRO™ application service layer powers up SharePoint and Office 365 to deliver true business automation capabilities. Applications built on NITRO™ drive productivity and efficiency by making full use of the SharePoint and Office 365 platforms. 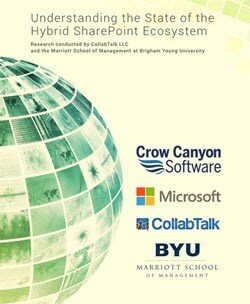 Crow Canyon helped sponsor a survey by BYU of 600 companies in an exploration to understanding the state of the hybrid SharePoint ecosystem. To begin, it shows only 1/4 of these companies are completely on Office 365. How to ensure compliance with complex electric industry regulations without being bogged down by inefficiencies? Is the management of your facility fully optimized and audit-ready 24/7? If not, then read on. Is your financial services company struggling to keep up with a deluge of compliancy regulations? Looking for solutions that are familiar, yet capable of addressing your needs? Look no further. Has the world of productivity apps already been conquered? Microsoft explores new vistas in Machine Learning and, with Google in its wake, eyes its newest challenger… Adobe. 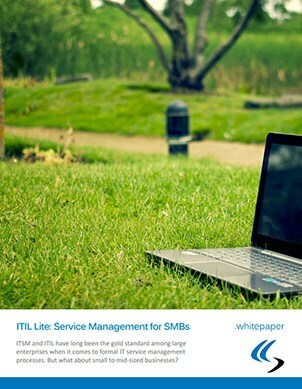 The ITIL Framework provides important guidance on IT Service Delivery, but is geared for large enterprises. However, the same principles can be applied, in a lighter way, to SMBs. With SharePoint 2016 on the horizon, many organizations are concerned about security-related features, particularly with regards to their integration with the Cloud. In this whitepaper, we’ll explore some of the expected changes to data security in SharePoint 2016. The growth of the cloud continues apace and is now being combined with on-premises deployments to create a new product termed hybrid. In this whitepaper, we’ll look at the evolution of the cloud and how the hybrid concept may become the new normal. Wondering what lies ahead for the remainder of the year? Ready for SP 2016? How about the cloud wars? And have Microsoft and Apple found common ground? Read on to find out.